Microsoft has announced that it will acquire LinkedIn for $26.2 billion (£18.5 billion) in an all-cash deal. The transaction is expected to close within this calendar year. The deal will see LinkedIn retain its brand, culture, and independence. Jeff Weiner will remain as CEO of LinkedIn but report into Microsoft CEO Satya Nadella. Reid Hoffman, co-founder and controlling shareholder of LinkedIn, and Weiner both support the acquisition. The deal was unanimously approved by the boards of directors for both companies. 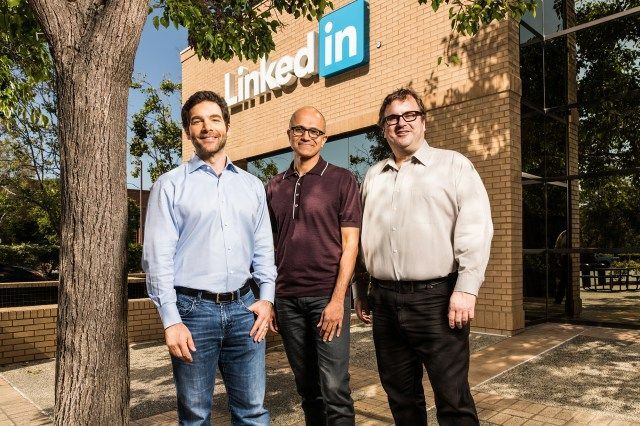 When the deal is complete, LinkedIn's financials will be reported through Microsoft's Productivity and Business Processes division. As for why Microsoft is acquiring LinkedIn, the press release offers a few saccharine morsels. "[T]his relationship with Microsoft, and the combination of their cloud and LinkedIn’s network, now gives us a chance to also change the way the world works," said Weiner. "Together we can accelerate the growth of LinkedIn, as well as Microsoft Office 365 and Dynamics," said Nadella. At $26.2 billion, this is one of the tech industry's largest acquisitions—though it pales in comparison to last year's Dell/EMC merger, which at $67 billion/£43.6 billion was by far the largest tech deal ever.